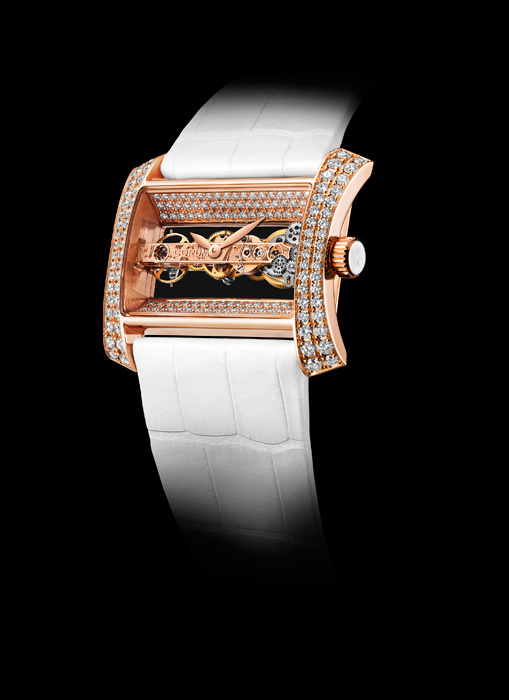 With the Golden Bridge Lady, CORUM introduces a splendid and original interpretation of its legendary model. For the very first time, the famous mechanical hand-wound “baguette” movement is positioned horizontally in the case, delicately engraved to provide a stunning panoramic vision of the gear trains in motion. Its mainplate and bridges are crafted in 18K gold and topped by two black openworked hour and minute hands. The case of the new Golden Bridge Lady provides a splendid gold, diamond and sapphire stage-setting for the fabulous caliber. The contemporary-sized (41 x 34 mm) case of the Golden Bridge Lady, available in a choice of 18K red or white gold, is graced with perfect proportions well suited to dainty feminine wrists. The curving case band is set with 108 diamonds, accentuating the precious appearance of this exceptional timepiece. The ethereal vision of the movement nestling inside the case is enhanced by two horizontal flanges arranged on either side of the sapphire crystal case-back and set with 72 diamonds. Thus framing the movement like a genuine work of art, they further magnify the radiance and elegance of the exquisite Golden Bridge Lady. This epitome of elegance reserved exclusively for women as its name implies, sparkles with more than 2.5 carats of precious stones. The case is water-resistant to 30 meters and fitted with sapphire crystals on the front and back, both treated with an anti-reflective coating, while the crown is set with a white mother-of-pearl applique. The genuine crocodile leather strap comes in white for the red gold model and black for the white gold version, secured by a gold pin buckle. Due to their sheer complexity and exquisitely delicate gem-setting, only a few Golden Bridge Lady watches are to be produced each year.